Every spring, I take both horses, Serts (pictured above) and Tanna, to my vet, Dr. Matt Povlovich of Equine Medical Associates, for coggins tests, spring shots, and dental work. 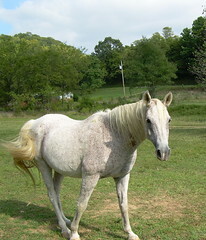 In March 2006, I did the normal routine and hauled both horses to Dr. Matt's office. During the course of the visit, Dr. Matt and I decided to pull blood on Serts because he had some small leisons in his mouth and we wanted to see if there was anything weird in his blood that would account for these. Serts was found to be slightly anemic, which isn't a major concern for a pasture potato. However, I thought it'd be a good idea to pull blood on Tanna, too. So I requested a blood panel. Tanna was found to be even more anemic than Serts. Tanna's red blood cell count (hematocrit) was at 26.6%, which was much lower than the normal levels of 32-52%. Dr. Matt explained that since Tanna is an athlete, his red blood cell count should be in the middle of the normal range and certainly not 5.4% below normal. I asked what the implications are for anemia and Dr Matt said it just means that Tanna would not have the energy to do as much as if he had the right amount of red blood cells. I made sure I would be ok taking Tanna to endurance rides while I was trying to remedy the anemia. Dr. Matt assured me it would be fine, Tanna would just get tired sooner than he would with the right amount of red blood cells. I did some research and re-evaluated Tanna's ration, paying particular attention to his B vitamins and iron levels. After careful consideration and consultation with my vet, I decided to supplement his ration with Vita-Key's Antioxidant Concentrate. I started on that supplement as soon as it arrived. In June 2006, I had Tanna's red blood cell count rechecked. He was at 30.4%. That was very encouraging and much closer to the low end of normal. Today, we had an appointment for another check to see if the upward trend had continued. And indeed it did! Tanna's red blood cell count is now 37.8%!! This is very good news. He is now smack in the middle of the normal range. Maybe this explains the increased energy level exhibited in one or two of my previous blog posts! LOL. Tanna and I both should be good to go for our endurance ride this coming Sunday at Cave Country Canter in southern Indiana.